Aeration is an important part of keeping a healthy lawn, but doesn't usually need to be done more than once per year. Aerating your lawn will allow better water and nutrient absorption, and will improve root growth. A lawn aerator can help break through excess thatch as well, but a dethatcher is still recommended for thatch over a half-inch thick. If you're fertilizing your lawn, using an aerator/spreader combo is a great way to get the fertilizer to the roots where it can be better absorbed. 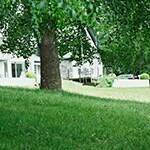 While most lawns only require aeration once annually, some conditions call for additional aerating. If your lawn has a significant pitch to it, such as being on a hill or a mountainous terrain, then rainwater likely tends to runoff more than soak in, which means your lawn dries out more. Aerating will allow water and fertilizer to soak into the soil and nurture the roots more easily. Lawns that feature a high percentage of clay have a tendency to more easily become compacted. Clay isn't as absorbent as other soil types, making it much harder to keep your lawn moist. New lawns, such as transplanted sod, typically cause layering between the sod and the indigenous soil beneath it. This makes it harder for the water, which gets soaked into the top layer of sod, to get into the soil under it where the roots are likely located. By aerating, you'll punch holes through the sod and into the indigenous soil, allowing water and fertilizer to get to the root system. Heavy thatch can also cause problems as it soaks up the water before it can even reach the soil. This can cause a dry sponge-like feel to your lawn, and should be addressed with a dethatcher. 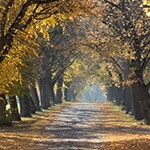 A common homeowner problem that calls for annual aeration is heavy foot traffic. Kids and pets playing on the lawn can compact the soil, and if your lawn is the neighborhood shortcut for kids walking to the bus stop, you'll probably want to invest in your very own aerator for annual or bi-annual aeration. You may think there are particular times of year that are best for aerating, and you'd be right. 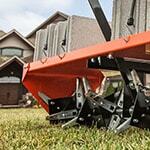 Fall and spring are the best times for aerating, and for good reason. Aerating in the fall will allow moisture to seep in better, and as temperatures drop, that moisture will expand, further loosening the soil. In spring, the frozen moisture in the soil will thaw and leave soil damp down deep. Aerating in the spring will loosen soil that's compacted from the previous growing season, and your lawn will easily recover in spring when growing conditions are ideal. If you haven't had any recent rain, your lawn may be rather dry. If this is the case, you should water your lawn the night before you plan to aerate. Thoroughly water it in the evening as the sun's setting, then let it soak up what it will overnight. Hard, dry soil is difficult to aerate. There are a couple styles of aerators to choose from - plug and spike. Spike aerators are simply spikes that poke into the soil to improve drainage and absorption. Plug aerators are like long cookie-cutters that stamp in and pull plugs of the soil out. This style is typically better for loosening compacted soil. If you use a plug aerator, you may feel a strong urge to clean up the resulting plugs on your lawn. Don't. Those plugs will dry up, and once they do, you should either break them up with a rake or mow them over with your lawn mower. As they dry and get broken up, they will blend back into your lawn to help absorb water around the root system. Once you've finished aerating your lawn, you should continue to care for it with regular mowing and watering. Fertilizing immediately after aerating is okay, as it'll allow the fertilizer to get down into the soil where the roots can absorb it. Plugging Away.. Our Power Equipment Direct how-to library can help you learn about How to Fertilize Your Lawn, Vote for Your Favorite Brands in Mower Madness 2019 and Official Mower Madness Contest Rules.